Rex Harrison was a popular actor in the 1950s (though he’s most-remembered for his work in the 1960s) and so NBC gave him his own radio series, as they did to many well-known stars during the first few years of the 1950s. In many ways, the series bore a strong similarity to the previous Bulldog Drummond series as Rex Saunders travels the world with an assistant helping out damsels in distress. Rex Saunders even has the same foghorn opening. The series lasted fourteen weeks and ended abruptly with the final episode announcing details of a fifteenth week program that would never be aired. The strength of the series is Harrison’s charisma and a few clever writing touches. 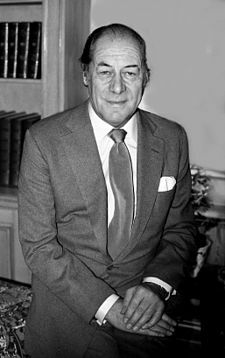 Rex Harrison (1908-1990): Harrison had a seven decade long career on the stage, in film, as well as on television and radio. Harrison broke into Hollywood with a critically-acclaimed performance in 1946’s Anna and the King of Siam.. His career peak came in the mid-1960s when he won an Oscar and Golden Globe Award for his performance as Professor Henry Higgins in My Fair Lady (1964). During this time, he also turned in great performances in Cleopatra (1963), The Agony and the Ecstasy (1965), and Doctor Doolittle (1967).